Maybe we should remember this when we hear about the Muslim Brotherhood working inside of the Executive Branch, or a planned "Million Man Muslim March on 9-11of this year on the Nations capital, or a $100 million dollar "Islamic Center" currently being built in Maryland. What stage is sleeping America in? Forget the Five Pillars of Islam. It is the Five Stages of Islam that threaten the fundamental freedoms of Western Democracy. Freedoms which include freedom of thought, expression, and association and the crucial derived right of freedom of the press. We should never forget that “Islam” means submission — the opposite of self-determination and Enlightenment values. Six years ago Dr. Peter Hammond published a remarkable book which included a statistical study of the correlation between Muslim to non-Muslim population ratios and the transition from conciliatory Islam to fascist Islam. The stages are the same in 2011 but the demographics have changed to show an alarming progression. Many European nations and the U.S. are on the cusp of moving to a higher bracket. The demographics change but the story is the same. First comes the taqiyya and the kitman; then comes the Sword of Islam. Imam Rauf, the Ground Zero Mosque promoter, is the current master of taqiyya. He has gulled everyone from Bloomberg to Maureen Dowd of the NYT — who fanatisizes over male Muslims. Expect doppelgangers of Khomeini for stage 5 and Islamic PEACE at last. Population density à 2% (US, Australia, Canada). Muslims are conciliatory, deferential but request harmless special treatment (foot bath facilities, removal/elimination of that which is offensive to delicate Muslim sensibilities – like walking dogs near Mosques). Population density 2% – 5% (UK, Germany, Denmark). The dispatch, dated February 2010, warns that that Jamaica could be fertile ground for jihadists because of its underground drug economy, marginalized youth, insufficient security and gang networks in U.S. and British prisons. Stage 3. Establish Sectional Control of Major Cities. Population density 5% – 10% (France, Sweden, Netherlands). First comes the demand for halal food in supermarkets, and the blocking of streets for prayers; then comes the demand for self rule (within their ghettos) under Sharia. When Muslims approach 10% of the population the demands turn to lawlessness. 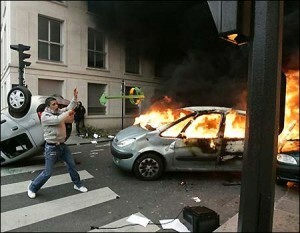 In Paris, we are already seeing car-burnings. Any criticism of Islam results in uprisings and threats, such as in Amsterdam. In France which may be over the 10% range, the minority Muslim populations live in ghettos, within which they are 100% Muslim, and within which they live by Sharia Law. 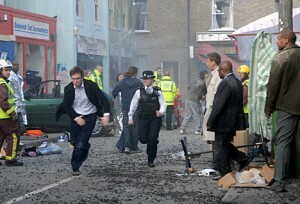 The national police do not even enter these ghettos. There are no national courts, nor schools, nor non-Muslim religious facilities. In such situations, Muslims do not integrate into the community at large. The children attend madrassas. They learn only the Koran. To even associate with an infidel is a crime punishable with death. Stage 4. Establish Regional Control. Population density 20% - 50% (Europe 2020?). After reaching 20%, nations can expect hair-trigger rioting, jihad militia formations, sporadic killings, and the burnings of Christian churches and Jewish synagogues. Stage 5. Total Control, Brutal Suppression, and Dhimmitude. Unfettered persecution of non-believers of all other religions (including non-conforming Muslims), sporadic ethnic cleansing (genocide), use of Sharia Law as a weapon, and jizya, the tax placed on infidels. As Muslim population levels increase and all infidels cower in submission there will peace at last. Dar al-Islam is achieved and everyone lives under Sharia and the Koran is the only word. Our current Western world leaders are suckered by taqiyya and kitman and steering us into stage 3. Allen West seems to get it but I can’t see that any of the crop of current GOP contenders really get it. Fear of bigotry at stage 2 is the Islamists’ greatest weapon. Crucified on the cross of bigotry — is that the future of the Western democracies? Bigotry is only bigotry if it is out of touch with reality and it is the suckers who believe the stage 1-2 peace pitch of Islam who are the ones who are out of touch with reality — not to mention our mesmerized President. The first GOP candidate who announces to Imam Rauf and his supporters, “Fine. A Mosque at ground zero. But how about a cathedral in Mecca first? It is part of our Christian outreach program of bridge building.” will be the first to get it and a big boost in the polls.